Amy’s going to be mad – I found a “deal.” No, really. I got $35 off internet prices on a pair of “open box” Roland DM-10 powered monitors at Sam Ash music. Let me tell you right now that if you’re listening to music from your PC using anything but professional grade digital studio monitors you simply do not know what you’re missing. And you can own them for less than the cost of some “gaming” surround sound PC speaker systems from Altec Lansing and Bose. This all started because I needed a set of speakers for my PC since I have none. I’ve always used a stereo receiver and speakers. 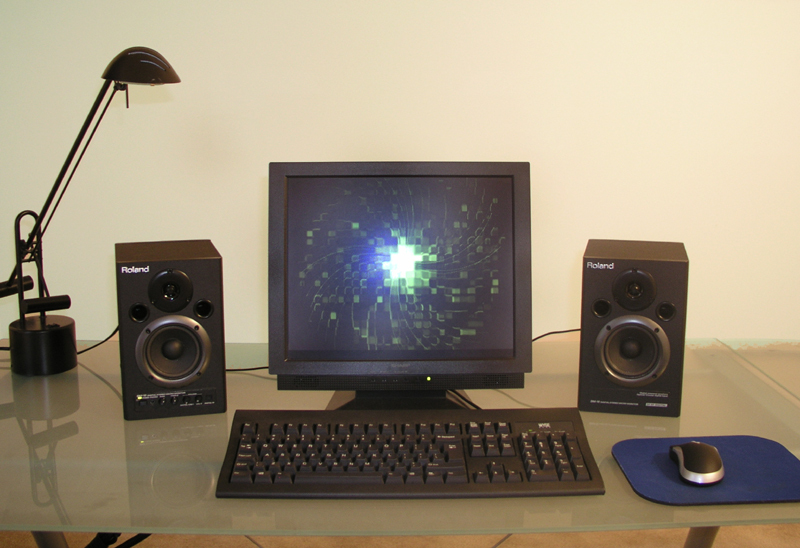 I began by looking at regular 3 piece PC speaker sets but was not happy that all of them were “PC silver.” My motivation for monitors became dual pupose – sound and appearance. When I walked into Sam Ash and they offered a discount on the last pair of DM-10’s in stock, I took ’em. I know it was weak and impulsive but these things sound incredible. If I feel bad about spending the money so close to Christmas all I have to do is turn them on and listen to Octane or The Coffee House on Sirius.